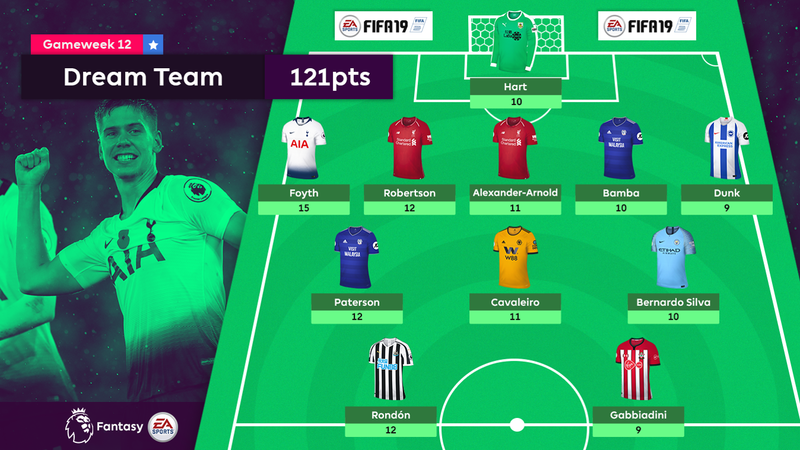 Differentials dominated the Gameweek 12 Dream Team. 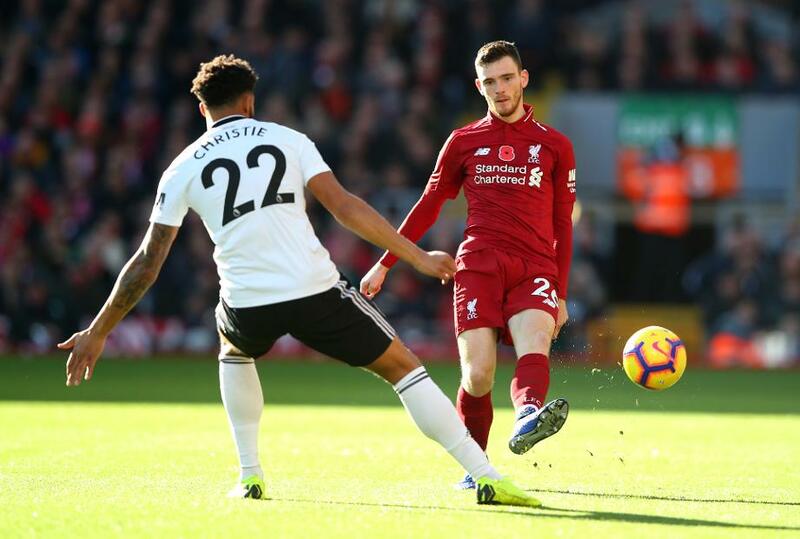 Andrew Robertson (£6.4m) and Trent Alexander Arnold (£5.0m) were the only players with more than 10 per cent ownership in Fantasy Premier League to make the cut. The Liverpool pair produced both assists and clean-sheet points in the 2-0 win over Fulham. By contrast, the Gameweek's highest scorer, Juan Foyth (£5.0m), could be found in only 84 FPL managers' teams. All three defenders line up in a 5-3-2 formation that scored 121 points. The Burnley goalkeeper was in fine form as Leicester City were held to a goalless draw. A clean sheet and maximum bonus points earn Hart a second Dream Team appearance of the season. The Tottenham Hotspur centre-back blanked on his Premier League debut last week. His second straight start was more memorable as he scored the only goal at Crystal Palace. The Liverpool left-back has produced consistent returns all season, but this is his first Dream Team selection. Robertson's third assist of the campaign earned him bonus points for the sixth time. The young defender matched his best tally of the season thanks to a clean sheet, an assist and two bonus points. He also makes his second Dream Team appearance this term. A second goal in 11 Gameweek starts helped secure the defender's first double-digit haul in FPL. Bamba's strike made all the difference as Cardiff City came from behind to beat Brighton & Hove Albion 2-1. Dunk's opener for Brighton made it back-to-back goals for the centre-back. He has either scored or kept a clean sheet in five straight matches. The Cardiff midfielder has revelled in a more advanced recent role, with three goals from his last four starts. He also chipped in with an assist against Brighton, earning him maximum bonus points. The Wolverhampton Wanderers winger only made his Premier League debut in Gameweek 7, but has now scored twice. His goal in the 1-1 draw at Arsenal was enough to secure all three bonus points. The Manchester City midfielder has started all but one league match this season, producing consistent attacking returns from Gameweek 1. He provided two assists in the 3-1 victory over Manchester United. The striker started consecutive matches for only the second time this season, but took his chance as the Magpies beat AFC Bournemouth 2-1. Rondon scored both goals and was also awarded maximum bonus points. The Italian played the full 90 minutes for the first time in the campaign as Southampton drew 1-1 with Watford. Gabbiadini's goal was only the Saints' second successful strike in seven Gameweeks.